Seminyak ~ One of Bali’s leading developers, Pt Hanno Bali was awarded a prestigious Innovation Award by the Indonesian central government at the weekend, honoring the firm headed by Canadian Hanno Soth for its high-tech approach to villa construction. In March the company launched its upscale C151 Resort, in the high-end area of Kuta renowned for luxury properties, fine dining and arguably one of Bali’ s most internationally renowned nightspots, Ku De Ta. This award was very unexpected and we feel very proud, very honored to receive the Citra Insani award from the Ministry of Justice Soth told a press briefing in Bali on Wednesday, after a trip to Jakarta to receive the honor. 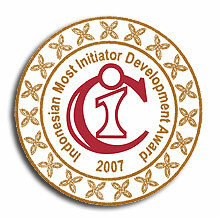 The Citra Insani award has been given out annually since 1999, and pays tribute to peoples innovation, especially in contributing to the development of Indonesia. 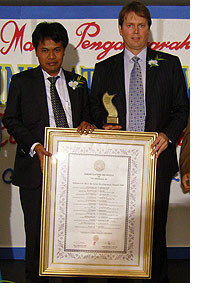 No one from Bali has previously been awarded the prize. This award can motivate our efforts in our future endeavors, said Soth, whose company is developing a string of islands near Singapore into luxury private getaways as well as ultra-modern residences on Bukit Bandung on the southern tip of Bali.